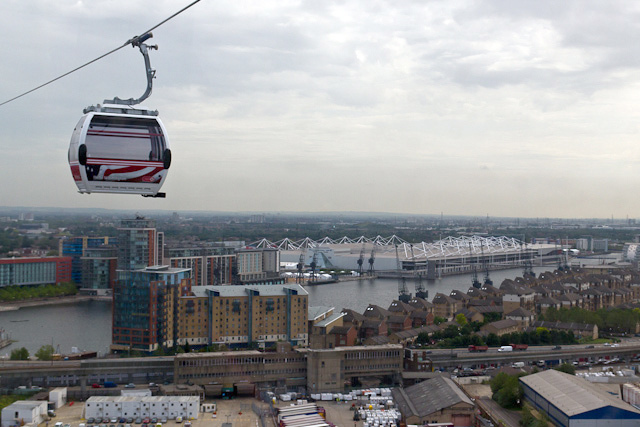 The east London cable car launched at midday today. 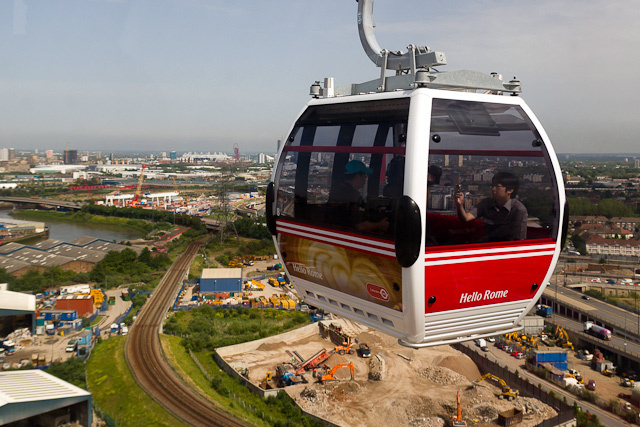 We nipped out to North Greenwich this morning to have a quick ride. 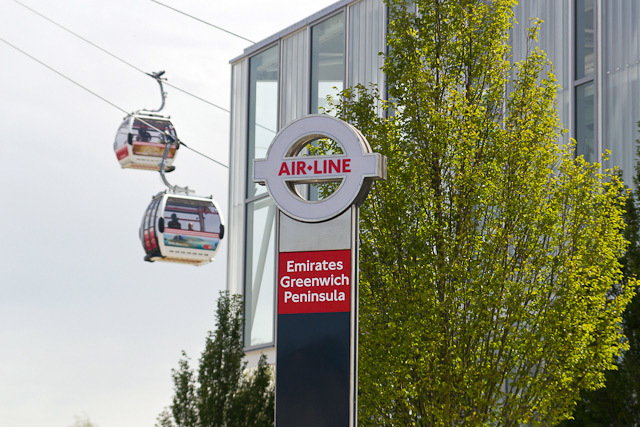 Dubbed the Emirates Air Line (despite the popularity of Diamond Geezer's alternate nickname) the cable car links the North Greenwich Peninsula with Royal Docks. 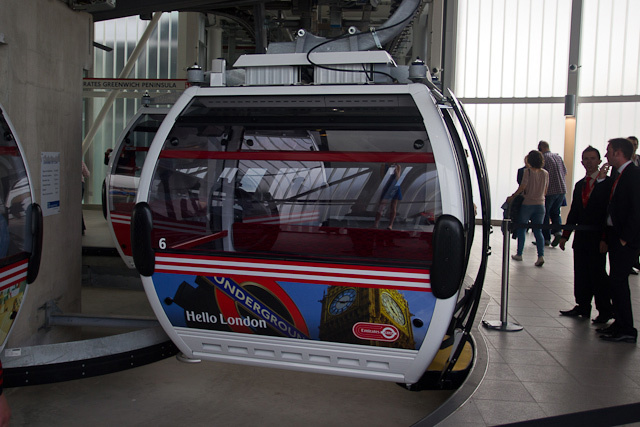 In one of the more controversial sponsorship deals in Transport for London's history, the eponymous airline got its name on the Tube map, and on the cable car's two terminals. The branding continues inside the North Greenwich terminal, with huge screens greeting new passengers on their "flight". 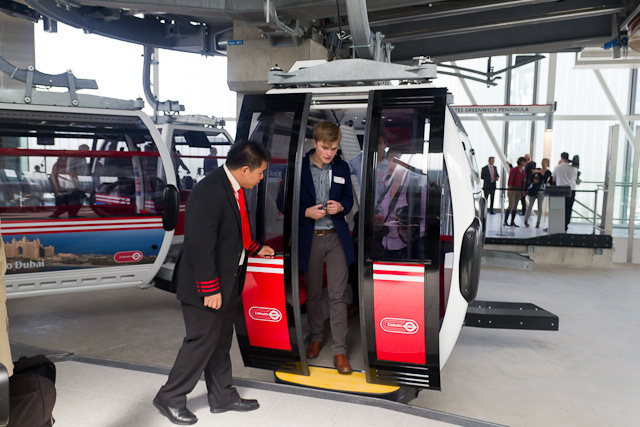 "Boarding" (the aviation terminology doesn't let up) is a simple enough matter, with the pods slowed down to allow passengers plenty of time to clamber aboard. Once clear of the terminal, the ride itself is remarkably quiet and serene. 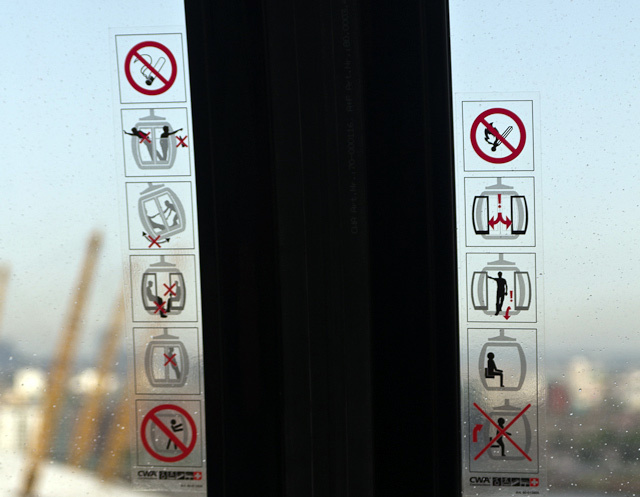 Save for the occasional automated admonishments ("please do not stand") the cable car is almost silent in operation, and the journey is mostly smooth, aside from the mild rocking as the pod passes across the towers. 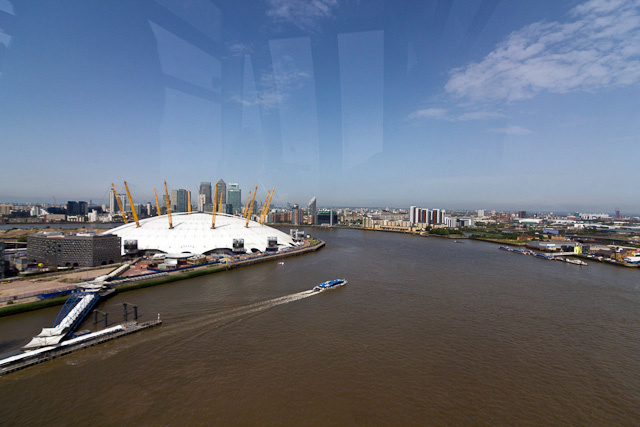 Rising 90m above the river, the cable car might trouble those not comfortable with heights, but the elevation offers views across the Docklands and Canary Wharf and toward the Olympic Park that are impressive, if not spectacular. 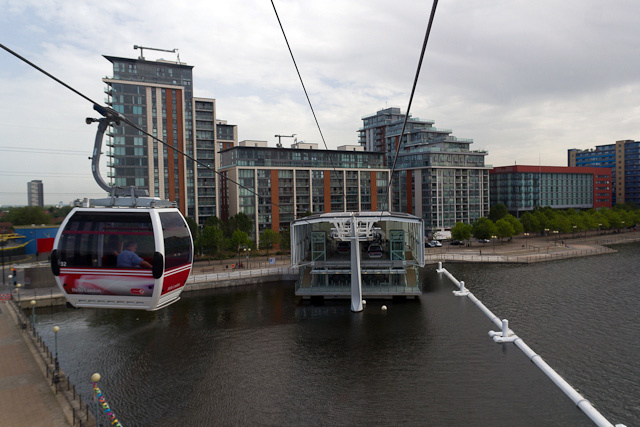 Four people were in the pod we rode on, which gave us ample space within the pod; however, TfL suggest that up to 10 people can ride in a single pod, which would make for a cramped experience. 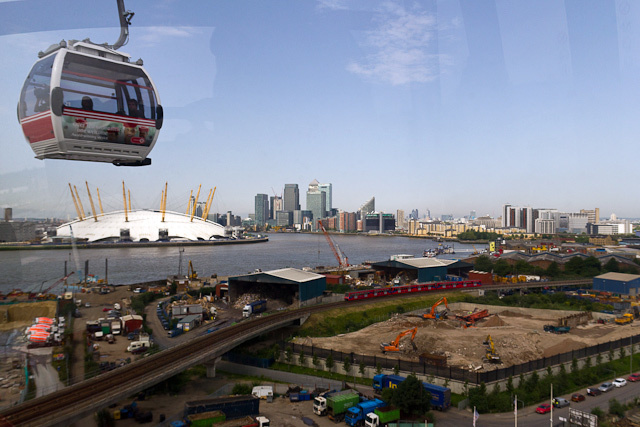 For all the controversy it has entailed thus far (particularly in the way that TfL has raided the rail budget to pay for it) the cable car makes for an enjoyable ride. Getting it open a month ahead of the Games is a major boost, and it is sure to be popular among tourists and with TV camera crews during the Olympics. 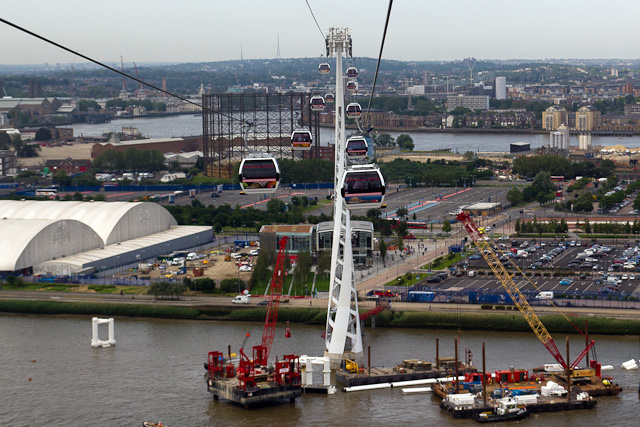 What it is not is a major part of east London's transport infrastructure, despite what TfL says. As we discussed earlier this month, the pricing (adult fares are £3.20 for Oyster users, £4.30 cash) puts it, at a pence-per-minute scale, on the London Eye end of things, i.e. a tourist attraction. 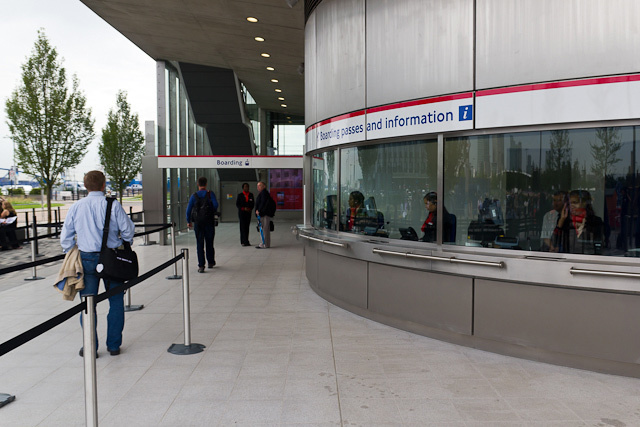 Transport chiefs have suggested that it might alleviate the Tube in the event of (not infrequent) Jubilee line breakdowns, but at 2,500 passengers per hour it has nowhere near the capacity of its subterranean sibling. 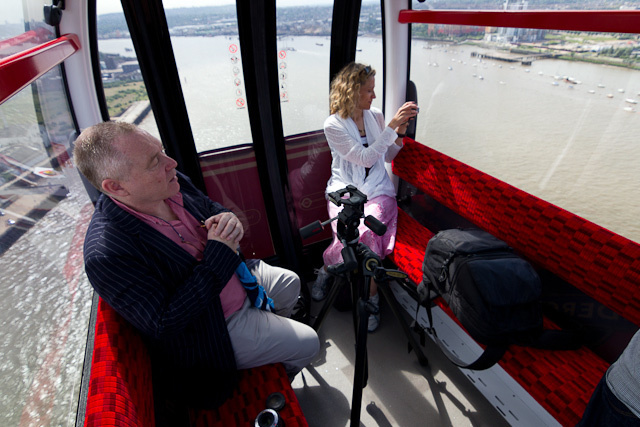 After the crowds have departed and the TV crews have packed up, will the cable car be anything more than an enjoyable but expensive folly? More importantly, will you ride it?